Why Do You Have Solar Panels, Again? There were a lot of hot water solar panels put up back when there was a tax credit for them, 20 years ago (or longer). Different from the solar panels we think about now, the ones that generate electricity, these old beasts were designed to heat water with sunlight. Think of a big radiator, painted black, stuck in a box behind plexiglass and mounted on the roof, and you’re about there. It exposes the water flowing through it to a huge surface area of hotness, and when it circulates back to a tank, can gradually increase water temperature with each iteration. I’d planned on making a system for my house with a couple of panels and an auxiliary hot water storage tank; water could be pumped through the panels, heating it, and be stored in that extra tank — and that warmer water would then feed into my gas-fired water heater at an already raised temperature — saving me energy. This was a great plan, but in order to make it pay off I knew I’d need to get most of the components on the cheap; I’d been on the lookout for panels and found a pair two hours away for $50. They were a huge pain in the rear to get home, being ten feet long, four feet wide, and super heavy. Here I'm running water through to see if it leaks. In the interim I’d been looking for pipe and fittings, as well as a circulator pump, that wouldn’t break the bank. If I paid full price, I’d never make the difference back in natural gas savings. Shortly after I scored the panels, I came across a fantastically high-end, super-efficient 80-gallon gas water heater for $75, and suddenly the economics of the solar hot water system went out the window. The panels languished until the stock tank came home, and I started puttering. I had two goals with the pool: first and foremost, I wanted to have at least warm water in it whenever we needed it. No matter how hot the day, a big tank full of cold water is bracing for a 4 year-old kid, to say nothing of her far older father. So I wanted to have a ready supply of water at, well, pool temperature. Second, I wanted to do it without buying anything that was designed for pools; my theory was the stuff at the pool supply store was probably overspecialized, overbuilt, and overpriced for what was essentially going to be a kiddy pool. So I wanted my “pool equipment” to come from the hardware store, if not just from my own garage. I needed a pump strong enough to circulate water from the tank, to the solar panel, and back to the tank. 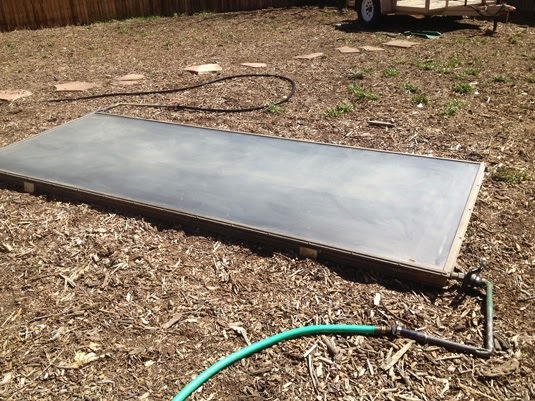 Pool pumps were expensive critters; the solar stock tank pool needed something different.